Cory Booker, known to many from his Twitter account and his seemingly endless heroic acts during his time as mayor of Newark, NJ, just signed a book deal with Ballantine Bantam Dell. "The book, entitled United, will be Booker’s vision of how to revitalize the American dream and will share insight into his policy ideas." 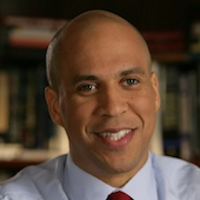 Booker currently serves as the Democratic senator of New Jersey. One can't help but wondering if this book is setting the groundwork for a future presidential run. For this year's Scholastic Summer Reading Challenge, Scholastic has partnered with representatives across the United States to promote reading. "44 governors’ spouses and 4 governors have signed on to serve in this position and inspire kids to “power up and read.” Each reading ambassador will receive 500 books to be delivered to schools within their state and host events to promote reading. Need a pick me upper after this trying week? Watch this 3-year old recite Countee Cullen's Hey Black Child.